Iranian President Mehmood Ahmadinejad has declared 9/11 Twin Towers attacks a big lie. Ahmedinejad said that 9/11 was an inside Job and was done By CIA and Mossad to occupy Muslim Lands. He said that the Capitalism that is established by the Israeli,s is about the fall and Capitalism has no future. 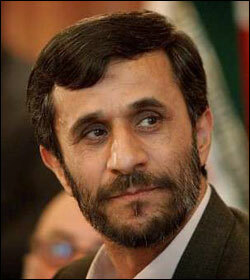 Ahmadinejad also condemn the innocent People killings in Afghanistan, Iraq and Palestine by US and Israel. Ahmadinejad also talked about the arrest of terrorist group Jundullah's top leader Abdul Malik Rigi that is backed by American CIA. He said that arrest of Rigi by Iranian intelligence agency was disgrace for CIA and Mossad. Rigi was arrested two weeks ago in Iran and after investigation from him he admitted connections with CIA.